What are the Top Best Practices & Tips for Search Engine Optimization? Making sure your content is search-engine optimized is a crucial task for modern marketers. 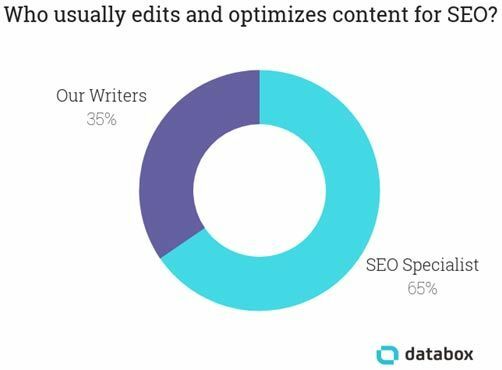 Whether you’re a writer or an SEO specialist, you need a solid grasp of how to optimize your content. 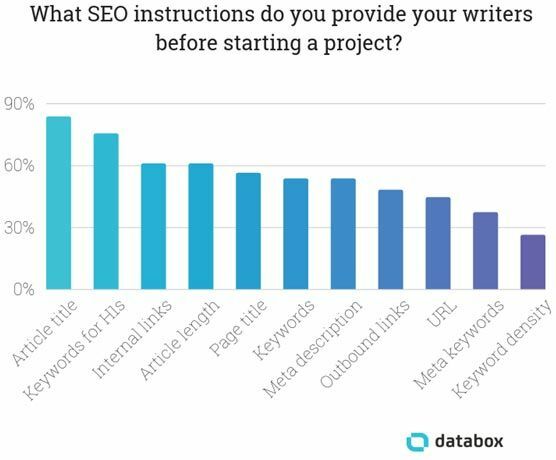 To help you, we asked over 100 marketers for their best advice, SEO tips, and best practices on writing well-optimized copy. If you can keep that in mind, you’re ready to start improving your content SEO techniques and skills. "At PACIFIC, we've seen first-hand that including SEO in the ideation phase can yield huge results in our content marketing efforts. A blog article that was rooted in answering SEO-sourced consumer questions naturally incorporated and ranked for a number of keywords while also yielding links and mentions." "It wound up ranking for keywords that weren’t intended because they were inherent to the way we spoke to the topic at hand." Brainstorming keywords/phrases people will search when looking for a product or service you are selling, and building a long list. For example, a shoe retailer might want to appear for "mens shoes" but they might also want to appear for variations such as "mens sneakers" or "mens sandals" or even information terms such as "what are the most fashionable mens shoes". Checking the monthly search volume for each keyword on that list using a tool such as Google Ads keyword planner, SEMRush, or Ahrefs and prioritizing by highest search volume first. Ensuring relevance by seeing who ranks highly for those keywords already. If your competitors (or similar businesses) appear for it then you know it's a good keyword to go after. On the other if websites that have nothing to do with yours appear, the keyword can't be very relevant. “Hopefully after following that you'll know what search term you want to target with your content, and this is crucial to get your content writing going in the right direction SEO-wise,” says Martin-Ross. Jessica Nelson with Vigor Visuals suggests: "Use the keyword research tool within Zerys to find out what topics your readers are actually interested in. This ensures your content will always be relevant and engaging, and Zerys ensures the writers properly keyword-optimize each post." Those tools should give you plenty of ideas for the 150–200 keywords that HEXONET’s Ana Milosavic recommends the SEO practice of compiling before you start writing. Use the keyword research tool within Zerys to find out what topics your readers are actually interested in. If you have content or a service that is specific to a location, make sure to write about it! “Many new marketers and writers believe that in order get results with content marketing, they need to insert a keyword in their content as many times as humanly possible,” says Aerin Ogden of Big Leap. “Try to use variations,” says Mashvisor’s Daniela Andreevska. My biggest SEO tip for today's day and age is to NOT worry about keywords so much. Find skilled Zerys writers and give them the freedom to use the suggested keyword semantically. “Quality is much more important to SEO today than it was 10 years ago,” says JW Digital’s Josh Williams. “My biggest SEO tip for writers and new marketers is to concentrate less on keywords and more on topics in 2019,” says Matt Press from Splash Copywriters. Typing in some keywords and seeing which questions related to the keywords that Google or Bing autosuggest (before you hit Enter on the search). Using Answer The Public to surface questions surrounding your keyword that people are searching for on Google. “Firstly, we want to understand what our prospects are searching for,” says Bowler Hat’s Marcus Miller. Before I put pen to paper, [I] start by typing that phrase into Google and reviewing the top 10 search results. “Here’s one tip that I see glossed over,” says Aeroflow Healthcare’s Alex Deckard. An easy way to provide SEO value within content marketing is to find a question people are asking, and then answer it thoroughly. “One SEO tip we have is to write web content in a question and answer format. With the advent of voice search using Siri and Alexa, people are searching directly with questions, instead of typing in phrases or keywords to Google,” says KDG’s Keri Lindenmuth. How do I make a peanut butter and jelly sandwich? Put the spread slices together and eat away! You can also use Google to help you find questions that people are asking, says The Source of All’s Shervin Mohseni. Are houseplants safe for pets? Once you’ve found your keywords, think about what your potential customers might want to know, continues McCloskey. Then split up your article into headings that answer people’s questions. “My SEO tip for beginner writers is to ask and answer questions throughout your content,” says Lauren Hilinski from Shred Nations. Hilinski gives the example of a page on how to tie a slip knot. This strategy also helps you answer your readers’ questions more completely. And that, says Ceralytics’ Brandon Andersen, is important. “For search, the one tip I would give is to understand user intent,” says Analytive’s Tyler Brooks. Using this information to write content, First Mats has grown their traffic 700% over the course of the past year. “In the absence of organic keyword data from Google Analytics, you can use Webmaster Tools Search Query data to align your content marketing efforts with the intent of searchers on Google,” says Scott Benson of Benson SEO. Whether I am advising clients through my agency or training new marketers, the #1 thing I suggest to write content that will perform well for SEO is to use a strong, clear title. Veronica Raducan from Extend Studio recommends including two things in your titles: information that readers know they want and information that readers don’t know they want. ‘40+’ makes it immediately clear to a searcher that this resource contains a lot of useful information and monetization tactics. ‘Big and Small’ actually is an indication that the article actually looks at real sites, and how these are capable of monetizing their visitors, instead of just listing abstract information. ‘Make Good Money’ is a social proof, that these methods work, and are actually viable. Alex Wright, web designer and SEO consultant, emphasizes the SEO practice of writing titles for humans instead of search engines. When I was starting out I was told to spend as much time writing the title as you do the body of your content. There's so much shallow and cursory content on the internet that writing something substantial can really set you apart. But don’t just write long articles for the sake of writing long articles, says Miromind’s Dmitriy Shelepin. What would I be interested to find out if I decided to read the article? Who is your target audience and what is their expertise level? What information are these people looking for? Would the people reading the article ‘Multithreading in Java’ be interested in definition of Java, information about its founders or do they (most likely) know what Java is and are simply researching the multithreading topic particularly with some tips and actionable code examples? “To me, the foundation of great content lies in the commitment to provide massive value to the readers,” says marketing consultant Shane Barker. Create content that people will love to read and share. Create long-form content with in-depth information about the topic. Write simplified content that is easy to read and understand. Include links to valuable statistics, case studies, and examples to provide more authentic information. Optimize your content for other ranking factors such as search-friendly URLs, meta tags, etc. We’ve mentioned related keywords in previous sections, but lots of marketers called out this strategy specifically for their SEO tips and best practices. One good thing that works well when writing for SEO and Humans is to use [what’s known] as LSI [latent semantic indexing] keywords,” suggests ALT Agency’s Craig Murphy. “I have been improving my articles by adding more related topics and keywords and have seen a 25-30% increase in traffic in the past 6 months,” Bansal adds. Where you can find these LSI keywords? Both Logan Shinholser from Full Sail and Cody Slingerland of Jawfish Digital recommend the “Searches related to” section of Google’s search results page. Local Falcon’s Yan Gilbert looks higher up the page at the “People also ask” section. Create an outline. Yes, like the ones your teacher used to make you do in school. And once you’ve created those headings, says AppInstitute’s Izaak Crook, be sure to add a table of contents so readers can navigate. “Bullet points and numbered lists are designed to make content easily skimmable for online audiences,” says Grayson Kemper of Clutch. Numbered and bulleted lists are often pulled for rich snippets because they tend to provide detailed responses to search queries. The bounce rate on your site lowers when you use these formats—when fewer people that bounce off your site, especially incoming search traffic, it signals to Google that your content is a relevant and authoritative result for a given query. Readability has a direct influence on user engagement metrics, which is a critical aspect that Google looks into when ranking web pages. Hasan gave the example of Backlinko’s “SEO This Year” page. There’s no doubt that Brian Dean is one of the best writers out there when it comes to reader- and search-engine-friendly structuring. Use his knowledge to your advantage. “A low bounce rate can shoot your site to page one on Google,” says Evan Roberts from Dependable Homebuyers. “Using unique names allows Google (and other search engines) to get a better feel for what you are writing about,” says Jenna Garvin of Virtual Freelance Guide. Always write alt text for your images, and include the keywords that you want to rank highly for in that alt text. “Once you publish, the job isn’t over.” added Kathleen Both, VP Marketing of IMPACT Branding. Booth’s team publishes 14 to 21 blog posts per week. She keeps a close eye on the performance of new posts, as well as the performance of old posts, always looking for opportunities to get more traffic or leads from the work that’s already been done. My take, and one that's certainly worked well for all my clients, is not to worry about SEO at all. I know this is total sacrilege in this day and age, but I hardly ever concern myself with SEO, hacking an algorithm, or digital when writing content. But, no matter how much emphasis you put on SEO or how aggressive your goals may be, hopefully these tools and SEO tips will take the mystery out of SEO for you. If you want to learn more about the best SEO practices, check out our white paper, "What's The Future of SEO?" or contact us for more information. Did we miss your favorite SEO content writing tips? Share it in the comments below. Dann is a freelance writer who helps B2B companies reach their audiences more effectively. With an emphasis on organic traffic and conversion, he takes big ideas and turns them into highly practical content that keeps readers hooked.